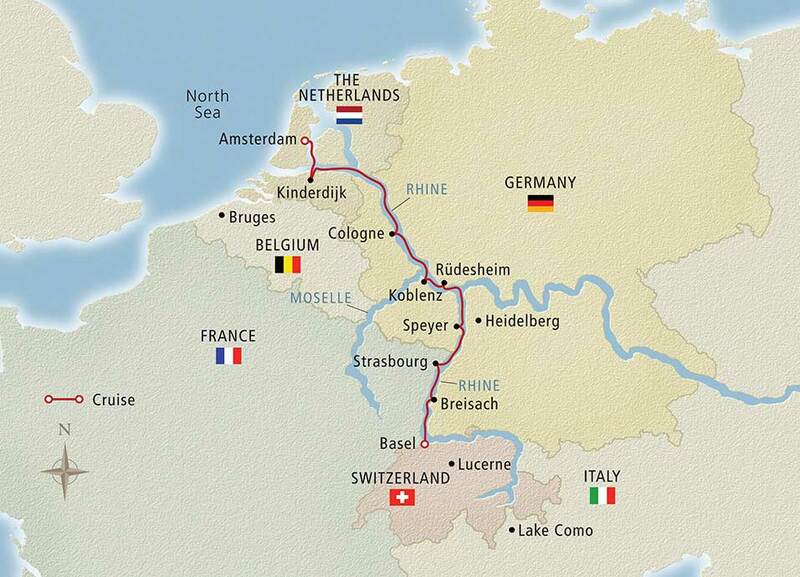 You are here: Home >Special > *Rhine River Cruises On Sale - 8 Days From $2099 US! 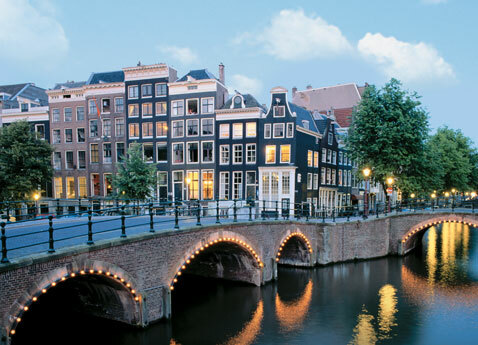 *Rhine River Cruises On Sale - 8 Days From $2099 US! All-Inclusive Rhine River Cruise Special! Visit all the highlights of the legendary Rhine River in just 8 days! In Germany, see the many charming castles commanding the riverbanks as you sail by, and tour both Marksburg Castle and the ruins of Heidelberg Castle. Admire Cologne, the jewel of the Rhine, with its awe-inspiring Dom, and experience the lush landscape of the Black Forest region. Also, explore Holland's famous windmills and waterworks, encounter multicultural Strasbourg in France, and take part in the inviting nightlife in Rüdesheim's Drosselgasse. On this itinerary you see a lot without spending a lot of time. ENJOY 8 DAYS, 6 GUIDED TOURS & 4 COUNTRIES! Board your Viking River ship this afternoon. Enjoy time to explore on your own. Continue along the Rhine this morning; arrive in Cologne and disembark for a walking tour. Stroll through Old Town past St. Martin's Church, and spend some time inside Cologne's Dom, a remarkable Gothic cathedral whose construction began in 1248 and was only completed in 1880. Explore the dockside taverns, cafes and shops on your own. As always, your Program Director can help you plan your free time. Dinner is served aboard and we remain docked until late evening. Arrive in Rudesheim in the late afternoon. Spend free time in the pedestrian-only Drosselgasse and sample a glass of locally produced wine at one of the restaurants or wine bars. Dine aboard your ship, or in town if you prefer. We depart after midnight. 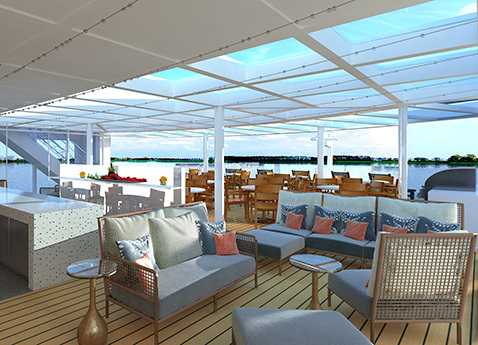 Cruise through the morning as you enjoy breakfast and the passing scenery. Arrive in Mannheim and disembark for a tour of Heidelberg to see Germany's oldest university, founded in 1386. Then, visit the beautiful sandstone ruins of imposing Heidelberg Castle and take in the scenery of the Neckar River Valley and the city's many red rooftops from this hilltop post. Continue with a walking tour through Old Town to Heidelberg's renowned gates. Rejoin your ship in Speyer this afternoon and take some time to look around. You dock in full view of the imposing Romanesque cathedral, a UNESCO World Heritage Site. Built in the 11th century on the site of a former basilica, the building's design influenced Romanesque architecture for centuries to come, and is the final resting place of eight German monarchs. Its soaring interior features graceful rows of sandstone columns and a large stained-glass window that was installed in the western facade during a later Gothic period. We dock this morning in Kehl and disembark for a guided tour of Strasbourg. See the European Parliament and tour the interior of the city's famed cathedral. The afternoon is free to further explore this Alsatian city's blend of French and German cultures, resplendent churches, medieval covered bridges, verdant parks and handsome Art Nouveau and modernist architecture. Dine aboard and enjoy free time this evening in the amiable little city of Kehl. Arrive in Breisach this morning, gateway to the Black Forest. Take a scenic excursion through the area's renowned mountain landscape, rolling meadows and dense forests. Once there, visit a local workshop and see a cuckoo clock-making demonstration. Return to Breisach or choose an optional excursion to the quaint Alsatian town of Colmar. Dine aboard and cruise on through the night. After breakfast, disembark and proceed to the airport or your hotel for an extended stay. December cruises include Christmas Markets! Special Cruise Savings Plus Airfare From $295 US! Viking River Cruises boasts the most extensive fleet of river cruises vessels, and we are proud to offer you the best ships in each region where we travel. Viking ships are specially designed to navigate the world's great rivers and provide convenient daily access to a plethora of destinations and experiences. Enjoy all the comfort and elegance of river cruising: attentive and professional staff, delicious onboard meals and spectacular scenery from every stateroom and public area. All fares listed are in US dollars. Fares are per person, double occupancy and include non-discountable amounts. Taxes are additional and vary according to itinerary. For new bookings only. Offers are capacity controlled and may be modified or withdrawn or sailing/departure dates may be substituted without prior notice. Certain restrictions apply.